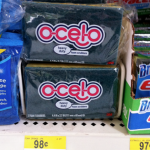 FREE Degree Deodorant at Walgreens! 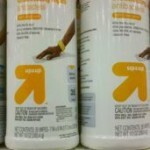 You are here: Home / freebies / FREE Degree Deodorant at Walgreens! 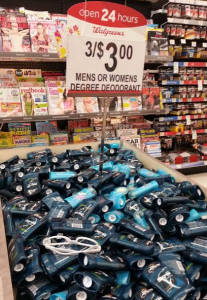 If you need deodorant, this week you can score FREE Degree Deodorant at Walgreens! 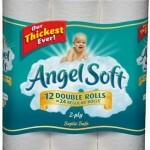 You can’t beat FREE, so get ready to stock up! NOTE: Even though the sign says 3/$3, you don’t have to buy 3. 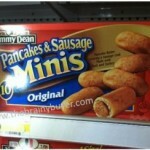 They will ring up at $1 each! 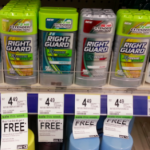 Right Guard Xtreme Deodorant just $.74 after coupon! 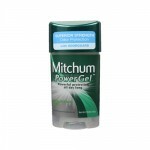 Mitchum deodorant: just $.99 at Walgreens & CVS!